Ever since I read this HuffPost Parenting blog a few months ago, I've been trying to be consistent with my son in asking him how he's been kind, brave, or how he thinks he failed during the day. The answers don't always come very easy and that's where its value lies. I find myself encouraging him to think hard and not take anything for granted. I tell him little things count. I remind him not to be afraid of failure and that when he knows better, he can do better and tomorrow is another day for redemption. Failure doesn't define him, but little acts of kindness and bravery always matter, both to him and the others he has helped. Today I find myself applying the same principle, reminding myself that acts of bravery, no matter how seemingly inconsequential, always count. To those who don't know me intimately, that may come as a surprise given that you might have seen me 'step up' in certain social situations. People say I'm friendly, I smile a lot and am very pleasant, I seem capable of chit-chat and seem really nice over all. What you probably don't know is that all of those things take so much energy out of me. Sure, those things come really naturally to me when I am around close friends and family, people I have known for a long time and feel really comfortable with. Other than that small circle, it becomes a huge undertaking for me and one that almost always requires a significant amount of planning and psychological preparation. Yes, I overthink and am always processing things in my head. Even the shortest, most insignificant telephone conversations with strangers, sales representatives, medical staff or insurance adjusters need some form of rehearsal in my head. I can't just randomly pick up the phone and fire away. I need to be clear with a purpose and where I need the conversation to end. Sometimes, it's as if I have an outline in my head (yes, sometimes written out too!) and any deviation from my 'script' can leave me panicked and, God-forbid, stuttering. In other words, I hate surprises and last minute things. I'm all about careful thought and planning. Something 'new' or 'unexpected' and potentially stress-inducing situations (a.k.a. huge social gatherings where I won't know majority of the people) need to simmer and stew in my introverted brain for a while before I can go forth and conquer. If we're not close friends, have nothing much in common and obviously don't know enough about each other to sincerely like each other, and my life didn't absolutely depend on it, approaching you to just say 'hello, how are you' won't come naturally to me. It's not that I'm a snob or am being mean. It's just that it takes so much energy out of me and feel the weight of a possible awkwardness too anxiety-inducing. This tendency of mine has gotten worse as I got older because now, I have learned to sift through my social circle and know when to simply not give a damn. Again, I'm not rude, so if you say 'hello' first, I will sincerely smile at you and say 'hello' back. This is me. This has always been me and I now stand in a space where I refuse to be made to feel bad or 'less than' about it. That's why when I ask myself now how I've been brave, I consider the little things, the little steps. 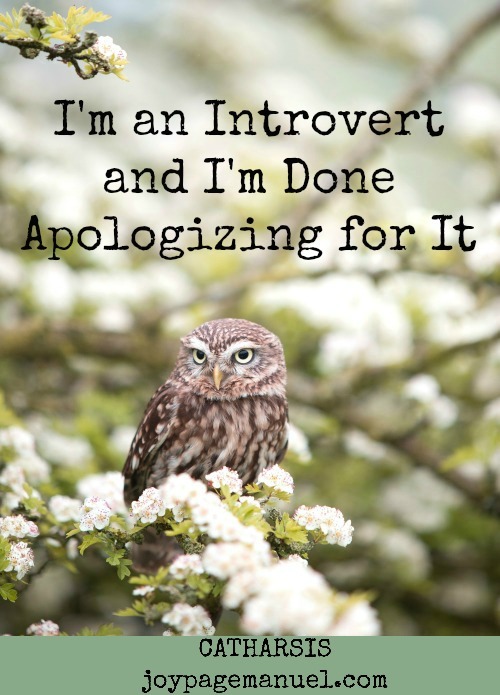 They may be steps I took to overcome my introversion when it was necessary, or little steps I took to stand firm in it and not apologize for who I am. Recently, my husband wanted me to attend a party with him. It wasn't necessary for me to go, it was far, and I knew I would only see a few acquaintances there. No friends, no one I really genuinely liked. To make matters worse, my husband has been so busy and so preoccupied with other things that he only remembered to tell me about the invitation the morning of said social gathering. I agonized for hours. I knew in my heart I did not want to go. I had been so busy myself the previous days and felt like I had reached my quota for the week for being social. I simply felt exhausted. Normally, I would give in to him. He would prod me, we would argue and I would feel bad about being called anti-social. But this time, I stood my ground. It wasn't about establishing who had more power over whom. It was about me having the courage to defend my preference. It wasn't simply about being intransigent. It was about heeding my authentic self and respecting my boundaries. It wasn't easy. I still felt tortured in the beginning and found myself making excuses to justify my decision. In the end, I realized I need no excuses. Politely declining an invitation should be enough and no elaborate explanations are necessary. I felt free. It felt amazing and empowering to simply have the courage to honor my introverted self instead of allowing it to be depleted. It's a small step but one I could definitely get used to. After all, the reward of having a relaxed time at home, in bed, while overanalyzing a cerebral show on t.v. is priceless and beats endless small talk with strangers any given day. Nothing about any of that requires any apologies. WE ARE THE SAME PERSON JOY! Our Divided States of America: What Now?